One of the benefits of being an empty nester is the ability to turn your spare room (children’s old bedrooms) into spaces you have always wanted…like your very own dressing room or, like me, a Yoga and Meditation room. In fact there are so many things that you can do with spare rooms…they don’t have to stay as “your daughters room”. At home we have three spare rooms that were our children’s rooms. One is in the process of being a guest room, the other will become an Airbnb room and the third is all mine “muhwahaha”…evil laugh and I’m having so much fun making it into my very own Yoga and Meditation space. At the moment my yoga mat and meditation kit is in the lounge which is not really ideal. In the mornings I often have my peaceful silent mediation broken by fighting cats or cats leaping onto my lap….not really conducive to a beneficial mediation session. Then the morning Yoga session is managed around the cats showing me how a proper downward dog is done, by doing big cat stretches followed by a clawing of the yoga mat. And that’s just in the morning. In the afternoon I again fight the cats and the mat plus I have my husband who likes to partake in my Yoga session, passively mind!!! Giving me critique on my poses. The best of all is at the completion of the savasana session I turn around and Pete’s zzzzzz out on the couch having received the benefit of Yoga by osmosis !! Needless to say it did not take much to persuade myself to consider turning one of the old bedrooms into my very own Yoga and Mediation retreat. The room in question was my daughters old bedroom, and due to recent house renovations it has all new, carpet, paint, curtains and blinds and fittings so I didn’t need to do any decorating as such, more just soft furnishings and accessories. Smell - or rather scents, which includes things like candles, tealights, incense and diffusers. Sound - chimes, gentle calming music and maybe a Tibetan meditation singing bowl. The latter I have not got however rather interested in sourcing one, they do sound so beautiful and restful. Touch - something tactile that aids your meditation, like mala beads. So when looking at my special items they actually mainly fell into each of these 5 categories…surprise surprise! I like to use essential oils and a diffuser, I also have incense and a burner. My favourite oil is Deep Relax from Fire and Ice using a small USB diffuser from Kmart. Trade Aid has the best incense and burners. I have a very small set of chimes, that make the most delicate sound when they catch the breeze through the window. It’s such a relaxing sound. I have a few things that I describe as filling my soul so I suppose these are my spiritual inspiration. They are an oil painting of Mt Aoraki which my Mumma gave me , a piece of rock or schist from the McKenzie country that my Sister found and a turquoise Bear from my dear departed Aunty. My mala beads which I sourced from a local online store Pranachic. My mala beads are essential for me in my meditation sessions. The other things that I needed in the room was more for my Yoga. Being able to have my yoga mat permanently laid out would be soooo good. Plus have my exercise weights , just 5kg dumb bells that I am using to help contain my bingo wings. The shape of the room itself is a bit awkward but has a lot of windows that get the morning sun. This is perfect for me as I always do my meditation and stretch Yoga session in the mornings. In the evening I do a full Yoga session so do not want lots of sun as it just gets all to hot for this old gal! Anyway in my mind I wanted to create two spaces, one for meditation and one for Yoga and I wanted a place to just chill and relax. So this is what I did. Once was two beds now there is one. All I did here was to stack one mattress on top of the other to create a high “day bed” I suppose you might call it. I just used a nice white cover, I think it was from The Warehouse and it was from the spare room, so not in use. I had a collection of cushions that I have kept for the spare room and decided that they would look better on this bed and I think they do. I love how it turned out, it’s super comfy, thanks to the two mattress’s. The bed can easily be made up for guests if needed so I don’ t lose any bedding options by using this room as a Yoga and Meditation room. So this may sound a bit silly, since I do Yoga!! however I have a dodgy old back and in the morning it is very stiff. This means that when I do my meditation in the morning I have to sit with my back supported, so I usually always sit on the floor on a rolled blanket with my back against the couch. So in this room I need to be able to sit against the bed. My meditation space is therefore in front of the bed and I have placed a small table directly opposite that has all my special things on it. It’s really nice now to have a focal point in the room for my meditation. At the end of the room I have my Yoga mat laid out…permanently.! and just have a full length mirror up against the wall. It can be really helpful to have a mirror to just check your technique sometimes, especially when starting out. And of course I have got some fairy lights for soft lighting. There is plenty of leg room, which when doing Yoga is important. Art and plants are still a work in progress here, it’s important not to over do it and clutter up the space. There were a couple of plants which I needed to rehouse and lucky for me they were perfect for this room. Over time I will put a few more plants in here, maybe some hanging from the ceiling. The only art that I have in the room at present is my wee oil painting that I have on my meditation table. My beautiful Sis has completed a mindfulness colour print for me which I will frame and pop it up on the wall, the colours go so well with this room. Also my very talented daughter is going to do an oil painting for me too however I think I might be waiting a while for that. 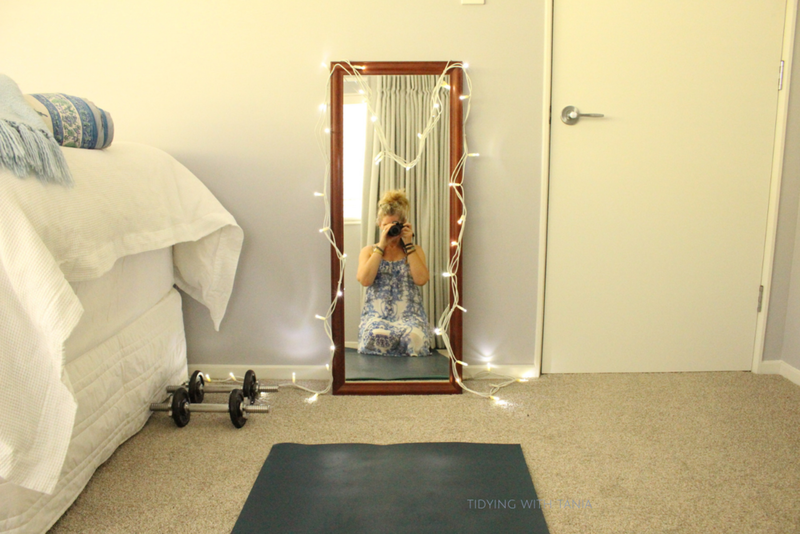 A string of fairy lights around the mirror provides some soft lighting and I tell you soft lighting is a must when you get up at the crack of dawn for meditation. It’s been a week since I started using my beautiful new room and I would totally recommend doing this if you can create your own space. It doesn’t have to be a whole room, you could easily use empty spaces in your house. Don’t miss out on all the extra goodies you can get in my monthly newsletters, just sign up below.